Experience this blissful and luxurious retreat overlooking a world-famous lagoon in French Polynesia. Located in a private cove on Motu To’opua, the Conrad Bora Bora Nui bungalows straddle the water, a soaring backdrop of Mount Otemanu, soft sand beaches, vast views of turquoise sea, limitless skies, and a suite of dining options and resort activities. 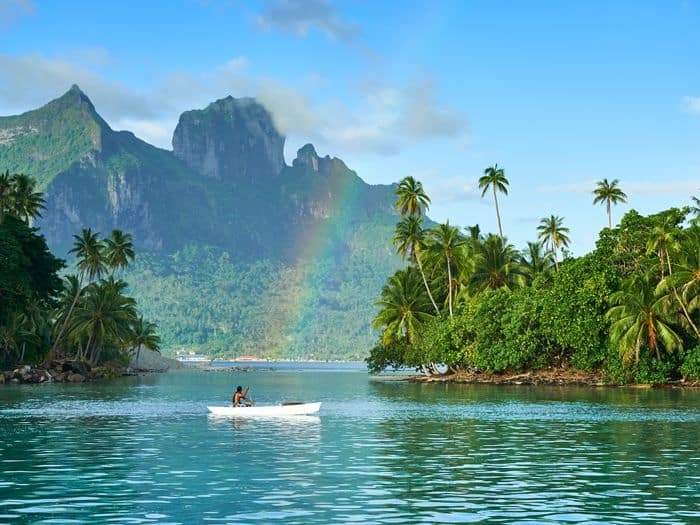 Located on the longest stretch of white sand beach in Bora Bora, this fully renovated resort is a tropical playground with unrestricted sunset views, diverse sea life, daily cultural activities, and access to the resort’s private islet, Motu Tapu. 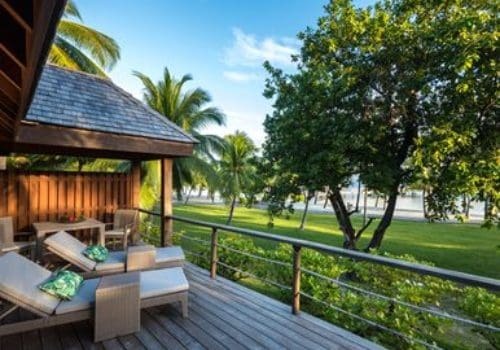 Relax stylishly at this Polynesian inspired décor beachfront villa while having direct access to the beach. Dip into the private pool as you enjoy sunset over the lagoon, and rest extravagantly in a king canopy bed at night. Immerse yourself in the uninterrupted views of the famous turquoise lagoon from your terrace, floating overwater hammock or inside the spacious villa with fully retractable windows – bringing the indoors out. These well-appointed villas are complete with a king bed, spacious bathroom with a separate bath tub, dressing room and seating area. Bringing the indoors out with the fully retractable windows, make your way to the spacious terrace where you will find the private infinity pool, floating overwater hammock and sun lounges. Having direct access to the lagoon, take a swim or snorkel from your terrace. Before you retreat inside to the comfortable king bed, ensure to soak in the views of the horizon and spectacular sunset while floating on the catamaran nets. Relax on the king bed of this spacious suite and soak in the stunning views of the lagoon from the private terrace. Unwind in the stylish bathroom or separate seating area featuring understated Polynesian-inspired décor. Nestled in our lush coconut garden, the villa offers a lagoon view from the private terrace. 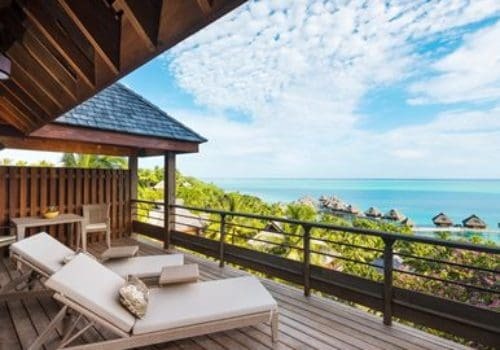 Beautifully appointed with a king bed and exotic Polynesian-inspired decor, this villa offers a generous separate lounge area and bathroom. Soak in the stunning panoramic views from the private terrace of this stylish villa, located on the hillside overlooking the lagoon. Relax on the king canopy bed or in the separate lounge area. Relax on the king bed of this spacious suite and soak in the stunning views of the lagoon from the large private terrace. This suite is ideal for families with connecting rooms, a separate and spacious seating area and bathroom. For the ultimate experience of luxury, our expansive two-story Presidential Villa features two bedrooms, three generous bathrooms, sauna, two dressing rooms and a spacious living room – and that’s just inside! Outside, the villa provides three separate terraces, an infinity pool overlooking the horizon, whirlpool, sunbeds, dining table, bar and lounge area – perfect to host a private dinner or special celebration and comes complete with your own personal butler! Unwind in the villa’s spacious infinity plunge pool and savour the lagoon views from the private waterside balcony. Relax on the twin beds of this spacious suite and soak in the stunning views of the lagoon from the private terrace. Unwind in the stylish bathroom or separate seating area featuring understated Polynesian-inspired décor. 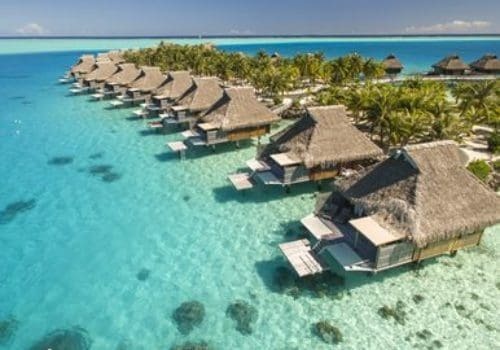 Conrad Bora Bora Nui is also home to overwater villas with horizon and lagoon views, and villas with private pools. Enjoy distinct dining options, including a sunset lounge with glass floor. Relax in a grand, full-service spa on the hilltop with panoramic lagoon views. Experience infinity pool, fitness centre, miniature golf, and complimentary water activities. The secluded beachfront resort is just 20 minutes by boat from Bora Bora Airport, and will coordinate your transportation. Enjoy exceptional cuisine in a stylish setting at the signature restaurant. You’ll take in breathtaking views of the lagoon from the comfortable banquet and veranda seating of the open-air restaurant. Discover this modern Chinese restaurant situated amidst a fabled banyan tree. Tamure Beach Grill is set on the soft white sand overlooking the picturesque lagoon and swimming pool. Upa Upa Lounge combines sophisticated comfort with the thrill of discovering the lagoon’s coral reefs and playground of fish with the feature glass floor and outdoor terrace. Iriatai Wine Bar is ideally positioned for a casual meal, pre and post dinner drinks, with sweeping views of the resort and lagoon. Listed as one of the top 15 pools in the world, and one of the key features of the resort is the glistering infinity pool featuring cabanas and a swim up bar.